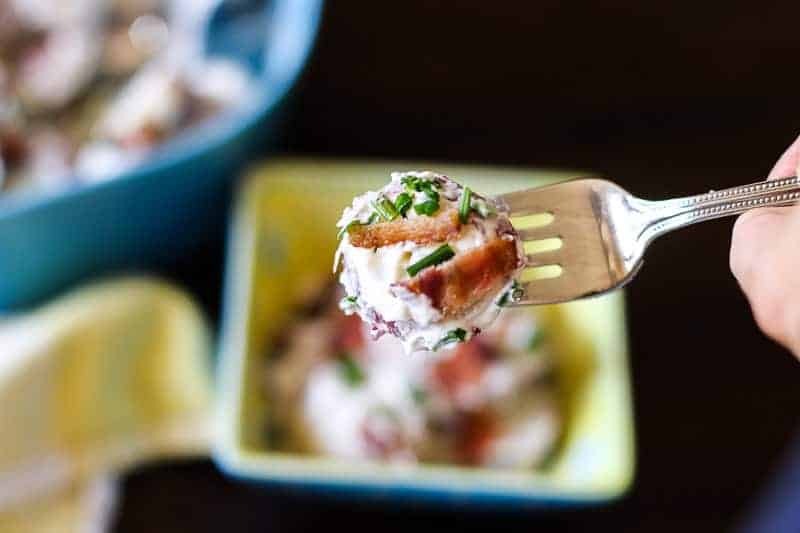 This easy bacon ranch potato salad recipe is delicious, easy, simple, and soon to be one of your favorite potato salads. Bacon and Ranch. Need I really say more? 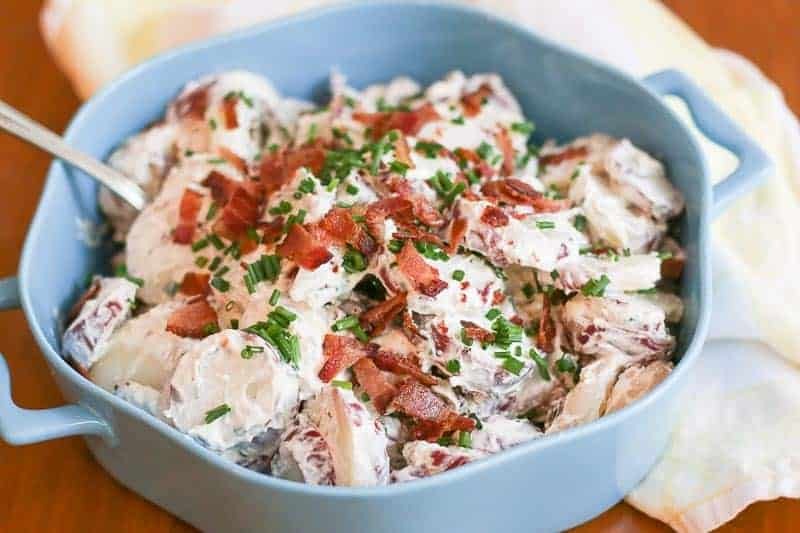 This easy Bacon Ranch Potato Salad recipe is delicious, easy, simple, and soon to be one of your favorite potato salads. It is the perfect side dish for a cookout, potluck, or family meal. Eat with caution. One bite leads to many more. 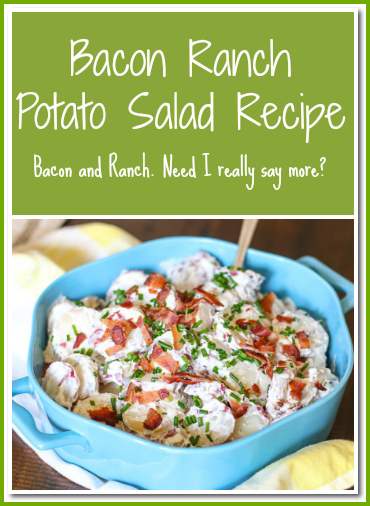 One of my dear friends Rachael loves potato salad… and to be more precise… she loves Bacon Ranch Potato Salad. She orders it to go all the time from one of her favorite sandwich shops, The New Deli, here in Fayetteville. One day she was ordering if for lunch and they ran out. She was so sad. That was the one thing she really wanted that day. I too have a love a really good potato salad, so I could totally understand her dismay. Because I love her dearly, I said I would come up with something like New Deli’s Potato Salad and make it for her. My creation isn’t exactly like theirs, but it is pretty darn good. It is perfectly creamy with salty, crunchy textures from the bacon, and hints of onion flavor from the chives. The combination works beautifully together. I bribe Rachael to come over all the time now by making this potato salad for her. I used the little red potatoes for this potato salad because they have a nice flavor that doesn’t get lost in the homemade Ranch Dressing. Now I am going to give you my favorite tip about potato salad that my husband’s Aunt Molly taught me. 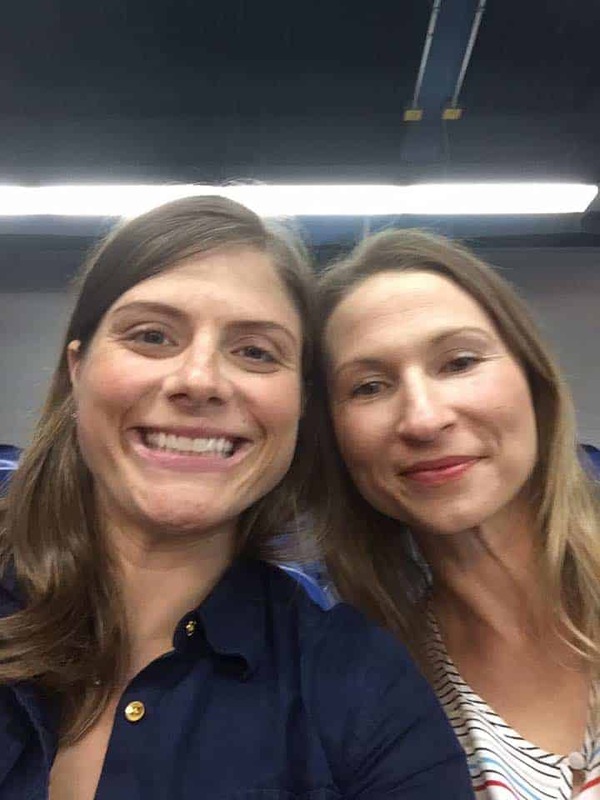 She was the sweet aunt that made incredible southern dishes like the Chicken and Pastry I shared with you… Her trick is to boil the potatoes until perfectly cooked, then rinse them off in cold water, and set them in the refrigerator for 30 minutes or more until they are completely cold. Only after they are completely cold do you mix in the other ingredients. Why? Because hot potatoes make the mayonnaise dressing melt and it becomes oily. Cold potatoes keeps the dressing from melting into the potatoes and you have a perfectly dressed, creamy potato salad. You are welcome! Look at that! A perfect bite! Enjoy! If you like this easy bacon ranch potato salad recipe, check out: Mediterranean Tuna Pasta Salad , Cucumber and Dill Salad, and Southern Baked Beans Quintet . Bacon & Ranch. Need I really say more? 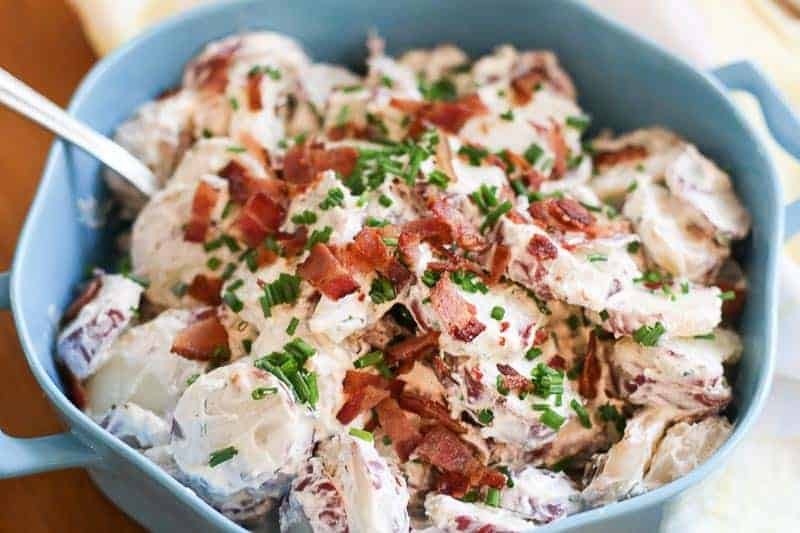 This easy bacon ranch potato salad recipe is delicious, easy, simple, and soon to be one of your favorite potato salads. After making it, this will become your favorite potato salad! Boil potatoes until cooked. Do not over cook and undercook. Potatoes should be tender enough to cut easily with a fork, but not mushy. Rinse potatoes in cold water and dry off potatoes. Refrigerate potatoes for 30 minutes or more until completely cold. Mix mayonnaise, sour cream, chives, and dry ranch season mix in a separate bowl. Drain grease from bacon and crumble. Mix in ranch dressing mix to potatoes. Add in bacon crumbles and mix well. You had me at bacon! Honestly this salad packs a ton of flavors and sounds so delicious! Can’t wait to try it! As a certified potato salad snob I just have to say this looks delicious!!!! OMG, who doesn’t love bacon!!?! Bacon makes everything better! Why have I not put bacon in my potato salad before? That’s about to change 🙂 You already have amazing ingredients….potatoes, ranch….and BACON! WOW Katie, this looks AMAZING! 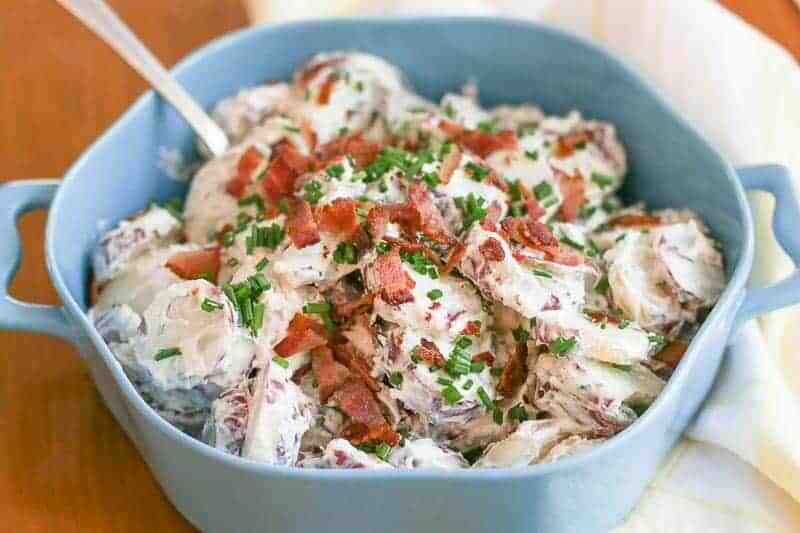 I love potato salad & the addition of bacon & ranch is pretty much genius! This is going to be made this weekend for sure!